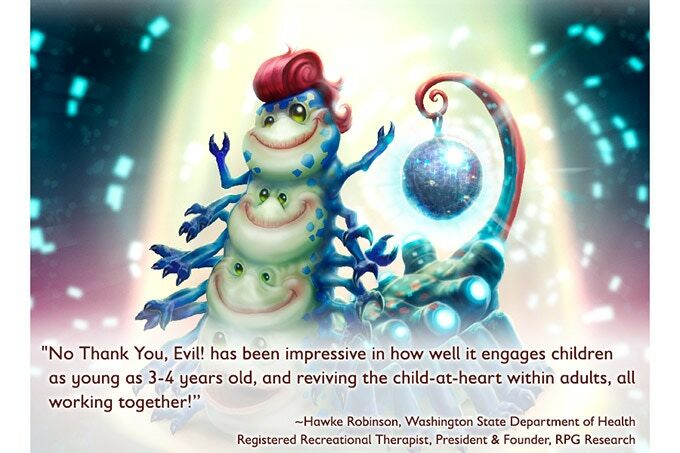 That’s the opening to No Thank You, Evil!, “a game of make-believe for creative kids and their families”, an engaging introduction to tabletop role-playing for ages five to fourteen. 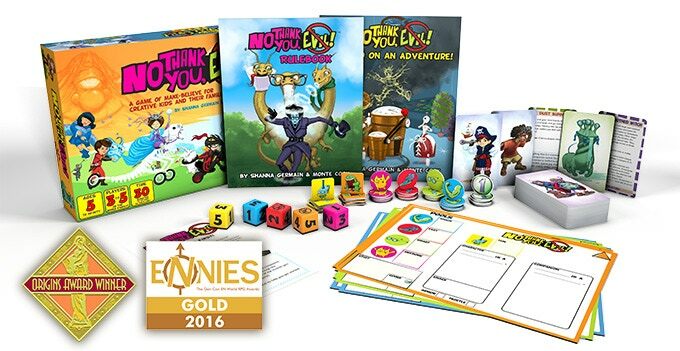 From one of the largest 3PP gaming companies out there, Monte Cook Games, this box set won both an ENnie and an Origins Award, and within this box there is a lot of family fun waiting. What is No Thank You, Evil!? The quick how-the-world-works setup can be summarized as a souped-up Narnia where the doors lead to adventures in lands peopled with the children that you love the most. What good time building blocks are in this box set? A map of Storia, that land of NTYE! The only differences in the box and the PDF versions are the dice, and the box set comes in a handy box so this game can fit with your board games when not in use. The box is slick with art that evokes a retro, childhood charm. It feels like a game from my youth with its oddball combinations like a dinosaur skeleton on wheels, frogfolk, a giant, Cyclops mountain, and a red-and-black, flaming big wheel all in the same image. It’s not just the cover, every No Thank You, Evil! product is loaded with age- and setting-appropriate art. 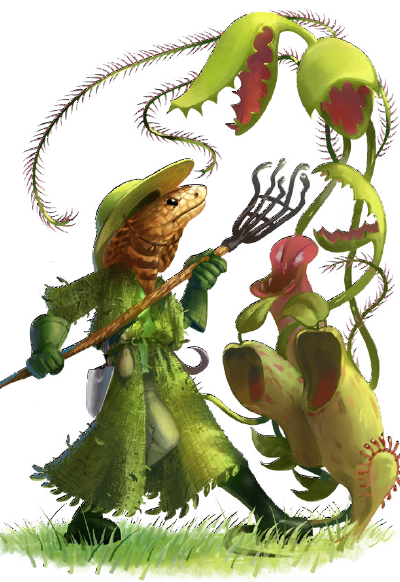 The snake gardener tending the cannibal gardens is a piece that embodies the zaniness of this world. 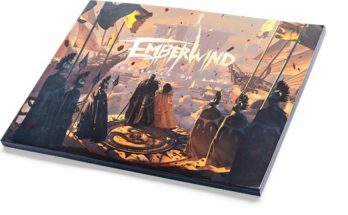 The art throughout this product offers a perfect vision of what this game offers – endless possibilities. The main book, the No Thank You, Evil! Rulebook by Shanna Germain and Monte Cook covers a lot of ground across its 96 pages. How to play the game (a straight 1d6 against a difficulty from 1 to 8 with points/actions to lower the difficulty), the powers and companions you can have, and the possibilities of this setting. As the youngest players learn the mechanics, they’ll also learn some educational basics. Like all RPGs, NTYE! requires some light math (excellent for the youngest players), but this game adds some beginning grammar – noun, adjective, and verb – and some light resource management. Don’t let the resource management scare you, it’s well-done through the system and easy to grasp using the Character Trait tokens. Players will have to decide when to spend their resources to gain the maximum effect (and they’re easy to replenish in-game). Each Character has a Companion – a pet or the like – that has a one-use power (Cypher) that, after using and feeding the companion a treat, is randomly replaced with a new Cypher. This adds a level of novelty to the companions, as they’ll always offer a new option in play. Each player’s “main” character has a steady power that can be relied on while the companion always keeps the game interesting with its new options. Death. Unlike some all-ages games, NTYE! clearly states that no character dies, they merely get Conked Out. Add to that, reviving them (to the full health/power) is an action that any other player can do. The game has a number of pre-generated characters and companions to make jumping into the game easy. The only issue I run into with the game is a lack of a list of Knacks (the powers that each character can have). The pre-generated have them and they can be made up on the spot, but a list would be helpful. 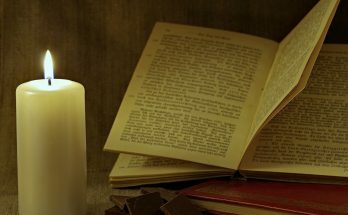 The other book, No Thank You, Evil! Let’s Go on an Adventure by Shanna Germain and Monte Cook, is an excellent companion piece to the rulebook, offering 13 pages of rule reinforcement and greater definition. The GM tips are key to ramping up a Guide (GM) and getting the most out of the experience. Following these thoughts are three adventures, one for each age group/experience level of the players. They’re solid introductions to what you can achieve within this rule set. Rounding out the box, there are character sheets, cards, tokens, and the map of Storia. Unlike so many box sets where cards or tokens are pretty extras but, really, feel like a product that you will not need after you remove them from the shrink wrap, these pieces make NTYE! more immersive. The pre-gen characters are available on a single card and, combined with tokens to track their stats and cards for the companions and the enemies, you can almost deal an adventure like a hand of cards (not really, but it’s not far off). These extras are easy to reference and very visual. Like all RPGs, the character sheets are useful but these are especially helpful with guides to determine what should be filled out. The system, the setting, the art, and the care that went into NTYE! combines to produce a quick system that is ideal to play with the youth in your life. No Thank You, Evil! is a beautiful, wacky game that, until Tuesday, June 5 2018 at 9:00 PM EDT, is Kickstarting a new printing (with more material than covered here); it’s worth checking out if you want to get your youngest into tabletop RPG.